The world we see is just a small portion of reality. Beyond our dimension, horrors incomprehensible to the human mind lie sleeping. At times, they might try and intrude into our world. That's when we must team together to try and stop it. 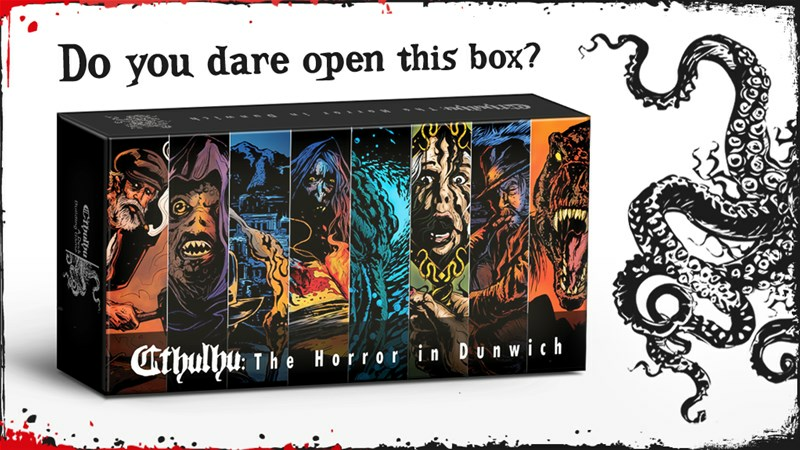 That's what you'll be doing, at least, in Cthulhu: The Horror in Dunwich, a new cooperative deck-building game that's up on Kickstarter now. Cthulhu commands you to read this press release. The creators of Cthulhu: A Deck Building Game are releasing a stand-alone expansion to the original called Cthulhu: The Horror in Dunwich. It will be available October 3rd on Kickstarter! Wyvern Gaming is proud to present Cthulhu: The Horror in Dunwich. To be played in conjunction with the original game, or separately as an independent game. As a cooperative, deck-building game, it expands on popular games that came before it, but also adds its own unique mechanics. Graham Sisk returns as the artist to delivery his dark, grim, chaotic interpretation of H.P. Lovecraft’s works. The campaign's a bit more than halfway to its goal with still 26 days to go.